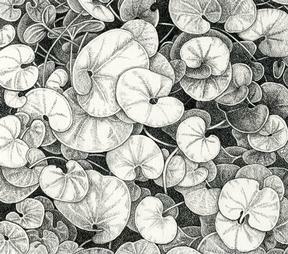 Dichondra is a warm-season perennial ground cover, best adapted for cool coastal conditions. It will grow in partial shade, but does best in full sun. Because dichondra does not tolerate heavy traffic, it is best adapted for small areas rather than large lawns or where mowing is difficult. Broadleaf weed invasions are common and can be difficult to manage. A bright green ground cover with broad, circular leaves. Dichondra is not a grass, but a low-growing broadleaf ground cover. High maintenance for water and fertilizer. 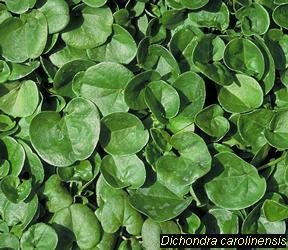 Dichondra requires well-drained soil and has a high nitrogen requirement. It has a low tolerance for salinity, drought, and very cold temperatures but tolerates some heat. Mowing is a matter of personal preference; it may either be mowed or remain unmown. Dichondra recovers only partially from moderate wear.